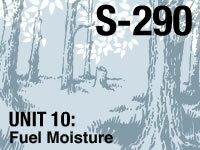 S-290 Unit 10: Fuel Moisture provides information about live and dead fuel moisture contents and their relation to fire behavior. Influences on fuel moisture and methods for estimating dead fuel and live fuel moisture in the field are summarized, and guidance is offered for assessing the potential fire danger based on fuel moisture and other fireline information. The module is part of the Intermediate Wildland Fire Behavior Course. Would really like to see this unit narrated. I would like to see more more videos explaining how to use the fuel moisture reference tables. I choose spanish lesson please. Would really like to see this unit narrated. Other than that information was arranged great. 10/10 would take it again. La lección complementa muy bien los módulos anteriores, dando un mayor contexto a la comprensión del desarrollo de los incendios forestales de forma cualitativa. The lack of narration really affected my ability to work through this unit. It’s harder to focus and understand when just reading on your own. Thank you still for the training. The consistency is not here with this less. most others are interactive. Lesson seems overly repetitive and largely boring. Yes, this is not a flashy topic but you go from general principals to convoluted calculations then back to general. Basically, the lesson breaks down to "wet fuels do not burn but dry fuels do" and "here is how calculations are done" that most firefighters would never have to determine. Need more videos and live action...more audio would help. I learned a lot more in detail on Fuel Moisture which will help out my understanding and decision making for work. Not as hard as they say. The best so far for me. Information was presented in clear language which was easy to understand. It's much better when it's videos. This was a super hard unit to follow on my own. I think it's a lot of information. Maybe broken down and have check on learning or completion quizzes along the way. More videos with SME's explaining it like the Belt Weather kit module, less charts and numbers. Mind-numbing, hard to retain. Would be nice if the module was vocally narrated. Good review of fuel moisture characteristics. Very good general presentation of fuel moisture, including how it's field-checked, and how it relates to relative humidity. Includes full-size PDF charts (similar to the tiny ones from your IRPG - worth downloading / printing for easier use in the field). The summary was really good but I think the lesson could be improved by adding narration. This unit was less interactive than some of the other units. There was almost no voice interaction. I think better explanation of the dry fuel moisture calculations is necessary. These took significant time to understand, and were very limited on the quiz. The charts are a bit convoluted and could be simplified. I passed, but I'm worried about the ones I did not get right. How do I review specific problem questions? even though there was no audio, i still thought this lesson was well done and informative. I already knew most of the topics contained in this lesson. What was knew for me was working with FMC and FDFM tables. I really apreciate it. the classes are very helpful . I do not like that there is no audio to a few of the lessons. I had to read the entire presentation. Some videos or sound bytes would have been great. Shoot me in the face. This was by far the hardest unit to this point. I think I would have a better grasp of the material if it was narrated. Very difficult to follow. This may have gone to far into the science of why instead of the application for wild land fire fighting. It is important to understand weather. I am not the Incident Meteorologists. Never will be. Tell me its dry, low RH, and watch the skies. There needed to be more multimedia in this lesson. (Actually there was none.) This was a particularly difficult lesson to just read through. It would have been beneficial to have more video and audio presentations. I feel that my retention of this information would have been greater with these changes. Knowing this is important for training. great to understand what we are dealing with in the field. A very interesting topic that kept me engaged. Having the graphs and figures was very useful, but it seemed like a lot of just reading which was tiring. I would have appreciated some video lessons, or graphics that showed calculations in place of reading text to explain. This lesson is significantly increased my understanding of the related topic in a very interesting way to learn. not the most interesting subject and is harder to follow along with out other interactions. the blocks in this s290 course that do not have interactive narratives to them are much harder to extract information from. Good lesson, but would prefer some audio to make more interesting. On the pictures were a little deceiving and were hard to differentiate. Keep a pocket guide or IRPG handy for Reference and Correction tables incase tables fail to load when using new Quiz Format. This Unit lacks some of the better visual aids/videos of other (perhaps revised) units. I felt like this was an easy course because all info was thorough. Thank you.